SIGNIFICANCE STATEMENT How real-world emotion, experienced over seconds, minutes, and hours, is instantiated in the brain over the course of milliseconds and seconds is unknown. We combined a novel, real-world experience-sampling task with fMRI to examine how individual differences in real-world emotion, experienced over minutes and hours, is subserved by affective neurodynamics of brain activity over the course of seconds. 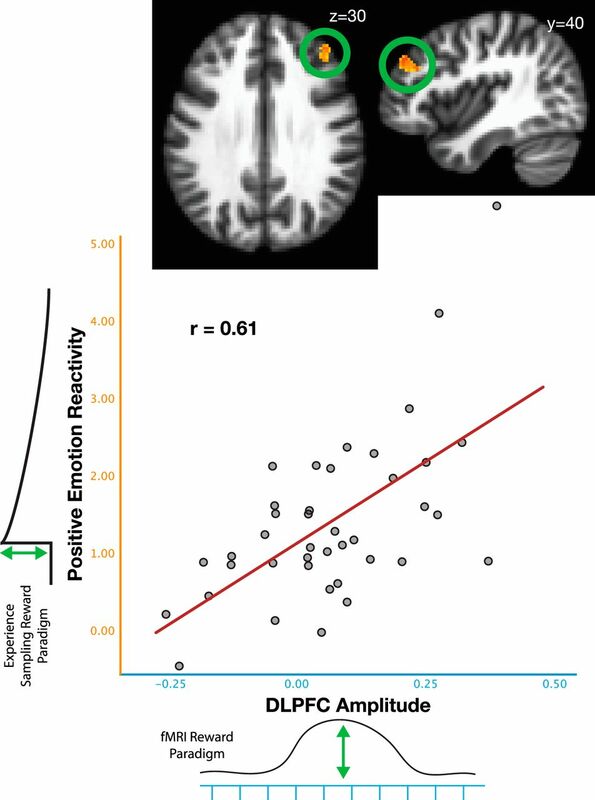 When winning money in the real world, individuals sustaining positive emotion the longest were those with the most prolonged ventral striatal activity. These results suggest that common pathways are associated with the unfolding of neural processes over seconds and with the dynamics of emotions experienced over minutes. Examining such dynamics may facilitate a better understanding of the brain-behavior associations underlying emotion. Emotional experiences typically unfold over minutes to hours, but the biological systems underlying these experiences respond more rapidly (Solomon and Corbit, 1974). Neuroimaging studies often assume that laboratory findings predict real-world experiences, yet little has been done to directly examine the link between laboratory measures of emotion-related brain function and real-world emotions. Furthermore, single emotionally rewarding events often reverberate over time, coloring future experiences. While studies of emotion typically measure the magnitude of emotion at single time points, there is rich information and variability in how long emotions are sustained across individuals. Such across-individual variability in the time course of emotion is relevant to health and well being (Davidson, 2004): even if two individuals experience similar initial joy from an event, some will savor it while others will not (Wood et al., 2003). The ability to experience and sustain positive emotion is critical to daily function, well being (World Health Organization, 2013), and health (Pressman and Cohen, 2005). Positive emotion is a precursor in the recovery from psychiatric illnesses (Zimmerman, 2012). Experiencing sustained positive emotion has several other salubrious effects including lowering levels of inflammation (Steptoe et al., 2005) and may extend life expectancy (Steptoe and Wardle, 2011). But how do basic neural processes pertaining to reward—typically unfolding over milliseconds and seconds (Smith et al., 2011)—relate to individual differences in real-world emotional dynamics unfolding over minutes and hours? Given prior evidence linking striatal structure and function to variation in positive affect (Haber and Knutson, 2010), one hypothesis is that individuals better able to sustain engagement of subcortical reward-related circuitry would be those evidencing more prolonged positive emotional experiences (Pizzagalli, 2014). Given that the prefrontal cortex works in concert with the striatum in individuals experiencing positive affect, it is possible that sustained engagement of emotion regulatory structures, including the prefrontal cortex, would be required for an individual to sustain positive emotional experiences (but see, Delgado et al., 2008). Despite these suggestive links, studies have not yet explicitly tested the association between real-world emotional dynamics and laboratory-based neural dynamics. Therefore, we examined how individual differences in the neural dynamics related to the duration of real-world positive emotional episodes. Cellular phone-based ecological momentary assessment (EMA) permits assessment of emotional dynamics as individuals navigate their world (Kaplan and Stone, 2013). These methods allow individuals to respond to text messages over days assessing current emotional functioning. To examine real-world positive responses experimentally, we developed a novel EMA paradigm by delivering rewards to our subjects as they navigated daily life (Fig. 1). Schematic of EMA and fMRI task. A, EMA occurred over 10 d. Emotional effects of real-world reward were measured over minutes to hours. fMRI analyses parsed BOLD reward responses into amplitude and width. These parameters were used to predict individual differences in naturalistic emotional reactivity and duration. B, EMA and fMRI task. In the EMA task, subjects received text messages in which they rated their positive and negative emotion several times a day. Each day, subjects also played a game in which they could win $15. After game outcome, emotion was sampled frequently over the ensuing 90 min and allowed estimation of positive emotion duration. In the fMRI task, subjects played the identical game in which they could win or not win $1. Subjects saw the number 5, guessed whether the next number would be higher or lower than 5, and received the outcome. A green arrow pointing upward indicated that the participant had guessed correctly. In our study, we combined naturalistic text message-based experience sampling with brain imaging. One hundred four human subjects engaged in 10 d of EMA assessment and rated positive and negative emotion ∼25 times per day. To estimate the effects of experimentally controlled emotional events on real-world emotional dynamics, we developed an experimentally controlled guessing game where subjects could win $15 during EMA. After each game, subjects rated their positive and negative emotion every 10–12 min. This dense sampling period following the game permitted us to assess individual differences in the duration of emotion following the controlled stimulus. To assess individual differences in lab-based affective neurodynamics, 40 subjects were recruited back to the lab and performed a similar functional MRI (fMRI)-based guessing game (Delgado et al., 2000) in which they could win $1 per trial. Subjects were instructed that despite the differing number of games and amount per game, the expected payout was equated across experiments. With fMRI, we examined both duration and amplitude of neural activity (over seconds). Finally, we tested whether individual differences in prolonged naturalistic positive emotion (over minutes) predicted the temporal variation in distinct neural circuits putatively responsible for emotion and its regulation (Ochsner et al., 2012). One hundred four human participants (mean age: 20.5, SD = 2.76, 43 male, 18–36 years) were recruited from the Madison, WI area and participated in a 10 d study examining real-world affective functioning. The University of Wisconsin–Madison Institutional Review Board approved the study. Participants provided informed consent. No participants were excluded. Participants provided their cellular telephone number and available 10–12 h periods for each of the 10 d. That 10–12 h period could vary across days. A customized web-based interface was built for scheduling and sending SMS messages. This customized interface communicated with a service provider (tropo.com) to execute sending of text messages. All text messages were time stamped. There were two, intermixed experience-sampling phases: baseline and game. Both phases occurred each day. Subjects were prompted at random intervals over the day to rate their current positive and negative emotion [“Please rate your current positive (1–9) and negative emotion (1–9”)]. Subjects responded with two digits, separated by a space. A “9” rating indicated the participant was feeling a very high amount of that emotion, while a “1” rating indicated the participant was feeling a very low amount of that emotion. If subjects did not respond within 7 min, their response was discarded. Subjects were instructed to take no more than a moment to check in with themselves and respond with the most appropriate number. Baseline-phase SMS messages were sent at 60–90 min intervals. To incentivize compliance, if subjects responded to >90% of the text messages within 7 min, they would receive an additional $4 bonus for that day, meaning they could make up to an additional $40. To have experimental control in an ecologically valid setting, we developed a game subjects would play in the field. This game served as an externally controlled stimulus to induce positive or negative affect. On each day, subjects played a game in which they could win an additional $15. They first received a text message telling them that they were about to enter a dense sampling period and asking whether they were available to respond during this time. If they responded “yes” then they received a text message stating: “The computer chose the number 5, please guess whether the next number will be higher or lower than 5.” Subjects replied with either “high” or “low” indicating their guess. Subjects then received a text message revealing the number the computer chose and whether the participant guessed correctly. If the participant guessed correctly, $15 would be added to their account. If they guessed incorrectly, they neither won nor lost money. Following this game, subjects' current positive and negative affect was assessed more frequently (every 10–15 min) for the subsequent 90–120 min. Behavioral testing indicated that SMS sampling at 10–15 min intervals was the most frequent sampling rate without reducing compliance. During this game phase, affect was assessed similarly as the baseline condition [“Please rate your current positive (1–9) and negative emotion (1–9”]. Probability of winning was flexibly modified so that subjects won five times and did not win five times. After the 10 d, subjects returned to the laboratory and were debriefed and compensated. EMA measures of interest included affective reactivity (immediate affective change in response to the game) and duration of real-world affect (over minutes to hours) in response to the game. To accomplish this, we used the time stamps of SMS responses. Positive emotional reactivity after winning the game was calculated as average change from baseline positive affect after game outcome. Thus, each subject had a positive emotional reactivity measure for winning and not winning the game. Duration of positive affect was quantified as the number of minutes for the subject's positive affect to return into the baseline state. Baseline state was quantified as follows: mean baseline positive affect ± (2 × (SD of baseline positive affect/sqrt (number of baseline samples)). Thus, following each game in which subjects won, the number of minutes to re-enter baseline state was calculated. Note that all analyses also applied to negative affect, even though brain-behavior associations of positive affect were of particular interest. Forty of 104 subjects (mean age: 20, SD = 1.5, 18/40 male, 18–24 years) were brought to the lab to examine how individual differences in reward circuitry engagement on short timescales predicted the engagement of longer term psychological experience of positive affect. Subjects were invited back for imaging if they responded to >80% of the text messages and indicated interest in participating in the fMRI portion. 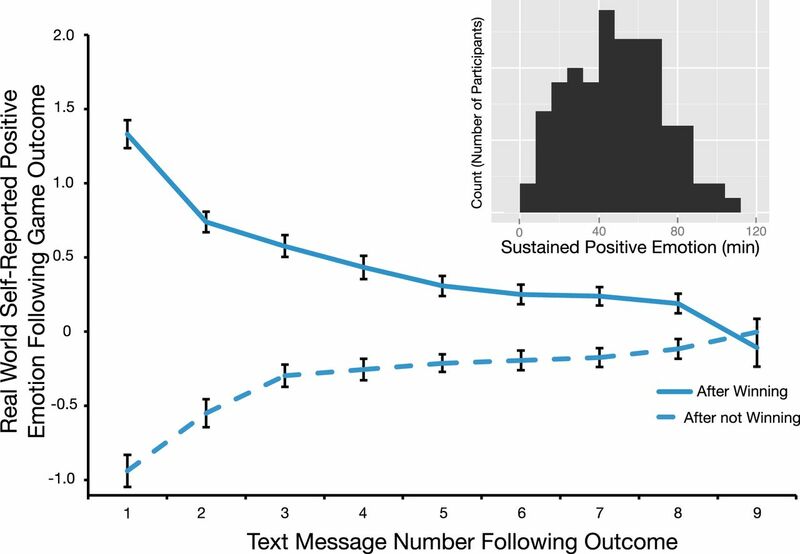 Those subjects responding to >80% of the text messages did not differ on baseline positive (t(86.26) = 1.02, p = 0.31) or negative affect (t(79.39) = −0.86, p = 0.39) from those responding to <80% of the text messages. 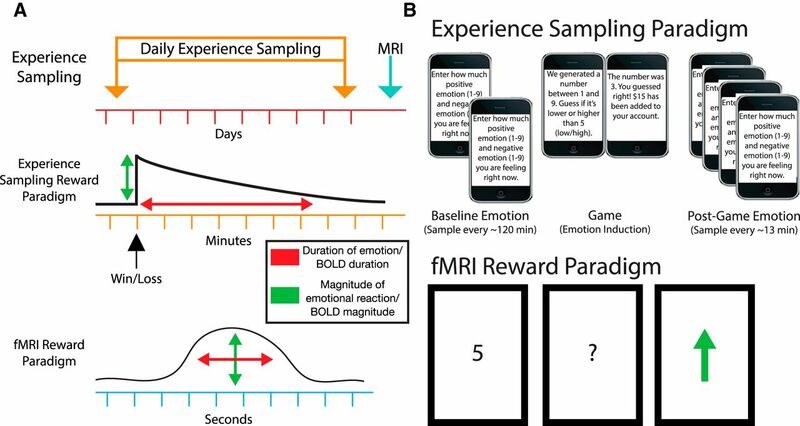 The fMRI task was designed to parallel the real-world experience-sampling game and was based on other fMRI paradigms of reward (Delgado et al., 2000, 2004). In this event-related task, each trial was worth $1. Individuals were presented with the number 5 and asked to indicate whether the target number was above or below the cue. Subjects were given 2 s to respond and register their guess. A variable 3.5–5.5 s anticipation period followed. Then subjects were presented with the number the computer had generated accompanied by either an upward or downward arrow indicating they had guessed correctly and won $1 or guessed incorrectly and had not won any money. Intertrial interval was variable (10 ± 4 s). Scan runs contained 20 trials; there were six scan runs total. Subjects were informed that they could win similar totals in both games as there were more trials in the fMRI than the experience-sampling study. Whole-brain images were collected on a General Electric 3 T MR750 scanner equipped with a standard clinical whole-head transmit–receive quadrature head coil. EPIs with a native resolution of 4 × 3.75 × 3.75 mm and 40 slices through the sagittal plane were acquired using a T2*-weighted gradient-echo EPI pulse sequence (FOV = 240, TR = 2000 ms, TE = 25 ms, flip = 60°, 173 volumes per run). Each scan run was 346 s. A high-resolution T1-weighted anatomical image was acquired (T1-weighted inversion recovery fast gradient echo, 256 × 256 [1.0 mm × 1.0 mm] in-plane resolution, FOV = 256 mm, 156 × 1.0 mm axial slices). fMRI data were slice time and motion corrected in AFNI (Cox, 1996). A study-specific template was created using ANTS based on the MNI152 template (Avants and Gee, 2004). EPI data were normalized to that template using FLIRT followed by ANTS' diffeomorphic normalization, resampled to 2 mm3, and smoothed (4 mm FWHM using 3dFWHMx). To examine affective neurodynamics, individual subject GLMs were performed using the Inverse Logit function (IL) developed by Wager and Lindquist (Lindquist and Wager, 2007; Lindquist et al., 2009). These GLMs were performed in two steps. First, a GLM was run in AFNI, which solely included nuisance covariates: six demeaned motion parameters, scanner drift, and censored TRs (if the participant had moved >0.9 mm in translation or 0.9 degrees in rotation). The residual time series was then used as input for the single-subject GLM using the IL model. The IL model parsed the fMRI signal into parameters including amplitude, width, and time to peak. Group analyses examined the relationship between individual differences in fMRI parameters estimated using the IL function (the width and amplitude) when winning the game in the scanner with duration of self-reported positive affect and positive affective reactivity after winning the EMA game. Between-subjects regressions were performed to examine these brain-behavior relations. Given the role of the ventral striatum in reward (Berridge and Kringelbach, 2008; Haber and Knutson, 2010), we performed analyses examining if there were effects specifically within the ventral striatum. To examine subcortical reward-related associations, we used an anatomically defined ventral striatum mask based on the Oxford-GSK-Imanova structural atlas (Tziortzi et al., 2011) and performed a small volume correction using Monte Carlo simulation corresponding to p < 0.05 corrected for multiple comparisons. In addition, we performed a whole-brain between-subjects regression corrected for multiple comparisons via Monte Carlo simulation. Mean baseline positive affect and negative affect were 6.00 and 2.90, respectively (SDs: 1.28, 1.17). Baseline positive affect was significantly higher than baseline negative affect (mean difference: t(103) = 15.87, p < 0.001). There was a trend toward a significant difference in the SD of affect such that individual subjects had more variance in their baseline negative affect than baseline positive affect (t(103) = 1.81, p = 0.07). The mean within-subjects correlation between positive and negative affect is as follows: r = −0.46 (SD = 0.24), indicating that 21% of the variance was shared between baseline positive and negative affect. We computed duration of real-world positive emotional responses as the number of minutes it took for subject's positive affect to return to baseline. After winning, subjects' positive affect stayed beyond their baseline positive affect for 49.21 min (SD = 23.53) and for 54.53 min (SD = 24.02) after not winning. After winning, subjects' negative affect stayed beyond the confidence interval for 62.36 min (SD = 24.53) and for 28.57 min after not winning (SD = 19.35). Emotional reactivity was computed as the immediate change in emotion ratings after learning the game outcome. Winning the EMA game ($15) immediately increased positive affect by 26% (mean = 1.33 points above baseline positive affect; Fig. 2). After not winning, subjects' positive affect dropped by 19% (mean = −0.94 points below baseline positive affect, t(103) = −8.65, p < 0.001). Negative affect also dropped immediately after winning by 28% (mean = − 0.72 points below baseline negative affect, SD = 0.92, t(103) = −7.94, p < 0.001) and increased by 45% (mean = 1.03 points above baseline negative affect, SD = 1.35, t(104) = 7.85, p < 0.001) after not winning. The EMA game impacts positive emotion as evidenced by deviation from baseline positive emotion. Histogram displays the distribution of duration of positive emotion following winning. Error bars represent standard error of the mean. To examine associations between real-world emotional dynamics and affective neurodynamics, these metrics of emotional reactivity and duration were used to predict individual differences in the amplitude and width of neural activity when winning and not winning the game. The most emotionally reactive individuals when winning the game (i.e., the largest immediate change in positive emotion) demonstrated the largest amplitude change in the dorsolateral prefrontal cortex (DLPFC) (max x,y,z: [−40, 42, 34]; B = 4.23, t(38) = 4.73, p < 0.001; Fig. 3). This was the sole area surviving whole-brain multiple-comparison correction. These effects were not driven by variation in duration as this association remained significant when controlling for both duration of positive emotion and width of DLPFC activity (B = 3.82, t(36) = 4.08, p < 0.001). The association between positive affective reactivity and DLPFC amplitude was specific to positive emotional reactivity when winning the game: Increases in negative affect immediately after not winning the game did not predict DLPFC amplitude when not winning the game (p = 0.63), and controlling for negative affective reactivity did not attenuate the association between DLPFC amplitude and positive affective reactivity (B = 0.07, t(36) = 3.58, p = 0.001). Amplitude of DLPFC engagement after winning predicts individual differences in real-world positive emotion reactivity. Thresholded at p < 0.05 corrected for multiple comparisons across the whole brain. Regarding duration, individuals sustaining real-world positive emotion the longest were those evidencing the most enduring bilateral ventral striatal activity (max x,y,z: [10, 8, −8]; Fig. 4) when winning the game (B = 16.43, t(38) = 4.68, p < 0.001; the mean across the entire bilateral ventral striatal mask yielded a similarly significant association B = 11.35, t(38) = 2.31, p = 0.03). For every 1 s increase in ventral striatal width in the fMRI paradigm, there was an increase of nearly 17 min in positive emotion as subjects navigated their daily lives. These effects were not driven by initial reactivity as the association remained significant when controlling for both positive emotion reactivity and ventral striatal amplitude (B = 15.58, t(36) = 3.55, p < 0.001). The specificity of this relationship was unique to winning the game as width of ventral striatal activity when not winning the game was unrelated to the duration of real-world negative affect after not winning (p = 0.22), and controlling for width of bilateral ventral striatal activity after not winning the game did not attenuate the association between ventral striatal width and duration of positive affect after winning the game (B = 0.02, t(36) = 3.93, p < 0.001). The width of the DLPFC cluster described above did not predict duration of positive affect (B = 0.01, t(38) = 1.40, p = 0.17). When examining similar associations of width of BOLD activity (across the brain) and positive affect duration of after winning the game, no other regions survived multiple-comparison correction. These results suggest that the associations between sustained positive affect and duration of reward-related neural activity were largely driven by subcortical striatal structures. Gender also did not account for any of the significant EMA-fMRI associations (all ps > 0.8). Width of ventral striatal engagement over seconds after winning predicts duration of real-world positive emotion. Green denotes the small volume mask used, and hot colors correspond to the suprathreshold activity within this a priori ROI; p < 0.05, corrected for multiple comparisons across the small volume ROI. We further examined whether individual differences in the persistence of positive affect during the baseline phase could explain the EMA-fMRI associations that appeared to be specific to the game. For each participant we calculated the autocorrelation in baseline positive-affect time series phase across four lags. Duration of positive affect after winning the game was not significantly associated with any of the autocorrelations (all ps > 0.24). We also re-ran the regression analyses in which ventral striatal BOLD width was significantly associated with duration of positive affect after winning but now controlling for baseline positive affect autocorrelation at the four lags. In all cases, the original EMA-fMRI association remained significant (all ps < 0.001) and in none of these models did the autocorrelation of baseline positive affect account for significant variance (all ps > 0.18). These control analyses suggest that the game was a unique, controlled stimulus and that emotional persistence at baseline did not account for these associations. Each day, acute events resonate over time, impacting emotional experiences by changing how we interact with the world. Our findings suggest that sustained activation of reward circuitry on shorter timescales is associated with a tendency to sustain positive experience over longer, real-world timescales. We extended real-world experience-sampling techniques by developing a paradigm in which a controlled stimulus is introduced into the lives of our subjects. Our data, demonstrating a relationship between sustained subcortical neural activity and prolonged positive emotion, provide a framework for studying how acute neural responses can give rise to our affects and moods. Unveiling the precise neurophysiological mechanisms by which sustained firing in subcortical structures on the second level may provide the foundation for individual differences in sustained positive emotion over minutes and hours is an important future direction or research. Recent examples (both direct and indirect) from the literature suggest that the duration of BOLD activity is indeed related to dynamic features of neural responses. Studies combining recordings from local field potential in human neurosurgical patients and fMRI support this claim. These studies (Mukamel et al., 2005; Nir et al., 2007) have found significant overlap (r = ∼0.75) in which the dynamics of local field potentials predict BOLD activity in auditory cortex. The combining of optogenetics and fMRI has also found that dynamics of BOLD activity is related to the duration of neuronal spiking (Kahn et al., 2011, 2013). It is unknown whether these BOLD dynamics are the result of local field potential activity or whether more specifically related to the spiking activity on neurons. 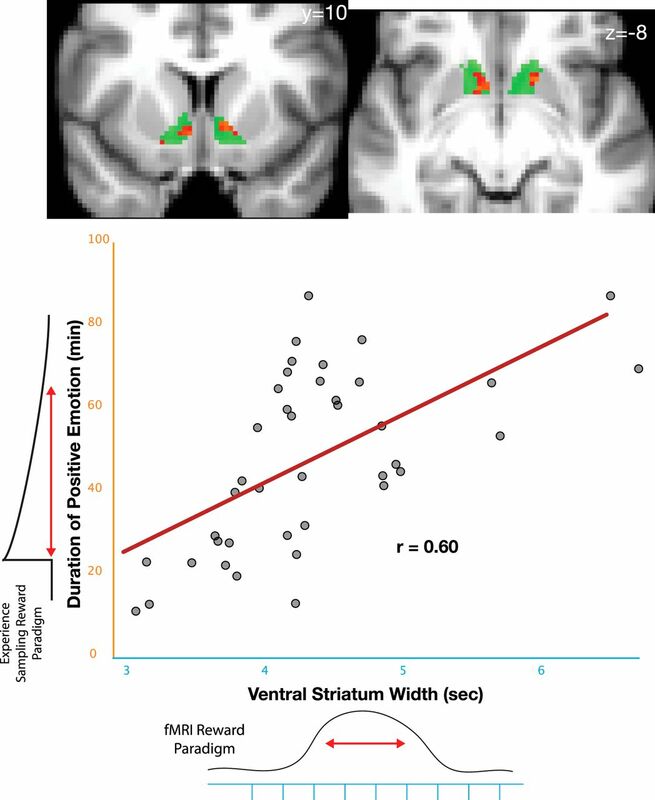 While these findings suggest specificity regarding the ventral striatum and prolonged positive affect, neuroscience indicates that the ventral striatum is not a valence-specific structure (Small et al., 2003; Floresco, 2015). Evidence suggests that valenced emotion and motivated behavior emerges from interactions between these subcortical structures (Stuber et al., 2011). Our data indicate that width of ventral striatum activity predicted sustained real-world positive emotion and not negative emotion, and that emotional reactivity was related to DLPFC amplitude. It may be that the interactions between these and other structures provide the basis of better delineating the affective neurodynamics of positive and negative emotional regulation (Li et al., 2011) across context and which dynamics are best predictive of health and well being. The importance of the daily experience of positive emotion in well being and recovery from psychiatric disease is underscored as mood disorder patients highlight increases in positive affect as being central to recovery (Zimmerman et al., 2006). Patients in treatment spend <1% of their weekly waking life in therapy, yet it is effective for many. Relating millisecond to minute timescales—connecting the brain to real-world emotional experience—may lead to new approaches for interventions that uncover short-term techniques to enact lasting change. By explicitly parsing emotion into its constituent parts and better characterizing individual differences in affective neurodynamics, neuroscience may inform psychotherapeutic intervention, that is, how and when to intervene in between therapy sessions in a way that facilitates plasticity in disordered affective circuits. Our data suggest that approaches that alter millisecond activity in affective circuits can lead to sustained positive emotion—improving emotional functioning and promoting well being. This work was supported by the National Institute of Health (R01 MH043454-27, T32 MH018931-28, and P30 HD003352-49) and through the support of a grant from the John Templeton Foundation. (2004) Geodesic estimation for large deformation anatomical shape averaging and interpolation. Neuroimage 23(Suppl 1):S139–S150, doi:10.1016/J.neuroimage.2004.07.010, pmid:15501083. (2008) Affective neuroscience of pleasure: reward in humans and animals. Psychopharmacology 199:457–480, doi:10.1007/s00213-008-1099-6, pmid:18311558. (2004) Well-being and affective style: neural substrates and biobehavioural correlates. Philos Trans R Soc Lond B Biol Sci 359:1395–1411, doi:10.1098/rstb.2004.1510, pmid:15347531. (2004) Motivation-dependent responses in the human caudate nucleus. Cereb Cortex 14:1022–1030, doi:10.1093/cercor/bhh062, pmid:15115748. (2008) Regulating the expectation of reward via cognitive strategies. Nat Neurosci 11:880–881, doi:10.1038/nn.2141, pmid:18587392. (2015) The nucleus accumbens: an interface between cognition, emotion, and action. Annu Rev Psychol 66:25–52, doi:10.1146/annurev-psych-010213-115159, pmid:25251489. (2010) The reward circuit: linking primate anatomy and human imaging. Neuropsychopharmacology 35:4–26, doi:10.1038/npp.2009.129, pmid:19812543. (2011) Characterization of the functional MRI response temporal linearity via optical control of neocortical pyramidal neurons. J Neurosci 31:15086–15091, doi:10.1523/JNEUROSCI.0007-11.2011, pmid:22016542. (2013) Bringing the laboratory and clinic to the community: mobile technologies for health promotion and disease prevention. Annu Rev Psychol 64:471–498, doi:10.1146/annurev-psych-113011-143736, pmid:22994919. (2011) How instructed knowledge modulates the neural systems of reward learning. Proc Natl Acad Sci U S A 108:55–60, doi:10.1073/pnas.1014938108, pmid:21173266. (2007) Validity and power in hemodynamic response modeling: a comparison study and a new approach. Hum Brain Mapp 28:764–784, doi:10.1002/hbm.20310, pmid:17094118. (2009) Modeling the hemodynamic response function in fMRI: efficiency, bias and mis-modeling. Neuroimage 45:S187–S198, doi:10.1016/j.neuroimage.2008.10.065, pmid:19084070. (2005) Coupling between neuronal firing, field potentials, and fMRI in human auditory cortex. Science 309:951–954, doi:10.1126/science.1110913, pmid:16081741. (2012) Functional imaging studies of emotion regulation: a synthetic review and evolving model of the cognitive control of emotion. Ann N Y Acad Sci 1251:E1–E24, doi:10.1111/j.1749-6632.2012.06751.x, pmid:23025352. (2014) Depression, stress, and anhedonia: toward a synthesis and integrated model. Annu Rev Clin Psychol 10:393–423, doi:10.1146/annurev-clinpsy-050212-185606, pmid:24471371. (2005) Does positive affect influence health? Psychol Bull 131:925–971, doi:10.1037/0033-2909.131.6.925, pmid:16351329. (2003) Dissociation of neural representation of intensity and affective valuation in human gustation. Neuron 39:701–711, doi:10.1016/S0896-6273(03)00467-7, pmid:12925283. (2011) Disentangling pleasure from incentive salience and learning signals in brain reward circuitry. Proc Natl Acad Sci U S A 108:E255–E264, doi:10.1073/pnas.1101920108, pmid:21670308. (1974) An opponent-process theory of motivation. I. Temporal dynamics of affect. Psychol Rev 81:119–145, doi:10.1037/h0036128, pmid:4817611. (2011) Positive affect measured using ecological momentary assessment and survival in older men and women. Proc Natl Acad Sci U S A 108:18244–18248, doi:10.1073/pnas.1110892108, pmid:22042845. (2005) Positive affect and health-related neuroendocrine, cardiovascular, and inflammatory processes. Proc Natl Acad Sci U S A 102:6508–6512, doi:10.1073/pnas.0409174102, pmid:15840727. (2011) Imaging dopamine receptors in humans with [11C]-(+)-PHNO: dissection of D3 signal and anatomy. Neuroimage 54:264–277, doi:10.1016/j.neuroimage.2010.06.044, pmid:20600980. (2003) Savoring versus dampening: self-esteem differences in regulating positive affect. J Pers Soc Psychol 85:566–580, doi:10.1037/0022-3514.85.3.566, pmid:14498791. (2013) Mental health action plan 2013–2020. (2012) Discordance between researchers and patients in defining remission from depression. J Clin Psychiatry 73:1262–1263, doi:10.4088/JCP.12ac08081, pmid:23059152. (2006) How should remission from depression be defined? The depressed patient's perspective. Am J Psychiatry 163:148–150, doi:10.1176/appi.ajp.163.1.148, pmid:16390903.